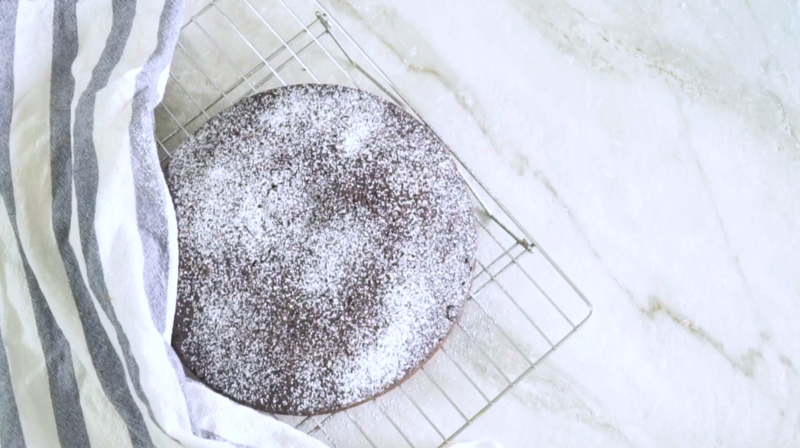 Bake this eggless chocolate cake made with olive oil for your next dinner party and impress all your guests. The cake is made with extra virgin olive oil because the fruity and nutty notes in EVOO will add complexity to the cake and enhance the flavors of the other ingredients like espresso and cinnamon. Add all the dry ingredients to a bowl, give it a whisk before adding the wet ingredients. Once the vinegar is added, the batter will change in consistency as you whisk. As soon as you see the mixture become frothy, get it into a cake mold and place into a hot oven. Bake in the oven at 350º degrees for 30-35 min. Use a toothpick to check if it's ready. Thoroughly cool cake for about 30 minutes. Recipe provided by Aneela Maharaj from Eating to Live channel on YouTube. Watch the full video below.